What is the traffic flow? 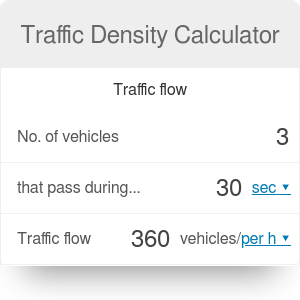 This traffic density calculator helps you analyze the traffic on any road. Thanks to this tool, you will be able to estimate what is the traffic flow and traffic density, as well as find out the average travel speed. You will also estimate the average distance between two consecutive cars on the road. Keep reading to learn how to calculate the traffic density and flow, or take a look at our MPG calculator! Traffic flow is defined as the number of vehicles that pass by a point in a given time period. This value is usually expressed as an hourly rate - for example, you can observe a flow of 500 vehicles per hour on a highway. where n is the number of vehicles that passed by a point during the time frame t.
The flow is equal to zero in two cases - either when there is no traffic (no cars present on the road), or when all vehicles are stuck in a traffic jam and cannot move forward. Traffic density is a second fundamental characteristic of any road. It tells you how significant is the congestion of cars on the road. If the density reaches its maximum, the flow drops to zero, as a traffic jam is formed. The reciprocal of the traffic density is the headway - the distance between the front tip of two vehicles driving one after another. This fundamental equation gives you the most basic information about the traffic on any road. The average travel speed on this road is equal to 60 km/h. Make sure to take a look at our gas calculator, too! Traffic Density Calculator can be embedded on your website to enrich the content you wrote and make it easier for your visitors to understand your message.